What causes a "Can't locate midascommon.pm in @INC" error? If you encounter an Internal Server Error after installing a self-hosted edition of MIDAS on your server, along with a "Can't locate midascommon.pm in @INC" message displayed either in your web browser or in your server's error log, then there are a couple of potential causes for this. For context, midascommon.pm is a dedicated Perl module for MIDAS. It is located on your server at the same location as your MIDAS system installation. MIDAS requires this module in order to function correctly. A "Can't locate midascommon.pm in @INC" error indicates that your Perl installation was unable to locate this module, because your MIDAS install location is not one of the locations on your server where Perl is looking for external modules. If you're running Perl 5.26 (or later) and are installing an older version of MIDAS (v4.19 or earlier), you will likely encounter this "Can't locate midascommon.pm in @INC" issue. This is because in versions of Perl 5 prior to 5.26, when executing Perl scripts Perl would search for modules in the current working directory. This behavior was changed in Perl 5.26, in which Perl will no longer attempt to locate modules in the current working directory. We are aware that this fundamental change in where Perl looks for modules has also been 'back ported' into some recent Linux versions of Perl 5.24 (notably on Debian systems). There are two resolutions for this issue; the first is simply to install the latest version of MIDAS (v4.20 or later, built after 19th December 2018). We've made changes in v4.20 to compensate for this change in Perl, so installing the latest version of MIDAS will avoid this issue. 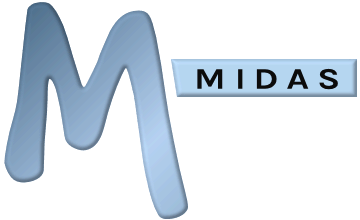 Whilst ensuring you're installing the latest version of MIDAS is the simplest and recommended solution, if installing the latest version of MIDAS isn't an option (i.e. if you don't have an Annual Support Subscription, or if you've chosen not to renew an elapsed subscription), and you run into this issue, then you'll need to "force" Perl to look for modules in the current working directory (i.e. the server location where your MIDAS system is installed). Install/Re-install MIDAS but append " -l path/to/your/midas/system" to the "Path To Perl" setting you enter during install. Modify the PERL5LIB environmental variable to include the location of your installed MIDAS system. You can add this to the ~/.bashrc to ensure the variable is always set upon server restarts. Some server installations, such as Apache installed via some versions of XAMPP, have an extension known as "mod_perl" enabled by default. "mod_perl" is not required by MIDAS and is known to cause problems, such as a "Can't locate midascommon.pm in @INC" error. To resolve this issue, please disable the "mod_perl" extension on your server. The following article explains how to disable mod_perl. Why do I see an "Unable to connect to database: Too many connections" error?